By wearing or carrying something ‘high vis’ which has both fluorescent and reflective materials, it will help you to be seen day, dusk and night: ‘Fluorescent for day, reflective for night’. Many people don’t realise it but… fluorescent colours don’t show up in the dark or ‘glow in the dark’. To be seen by drivers at night you need something reflective. In industry, yellow and orange fluorescent clothing is often worn under health and safety laws (for quality standard EN20471). You’ve probably seen police officers, postal workers, lorry drivers, builders and refuse collectors wearing these jackets. Horse-riders often wear pink as it is a colour not found often in nature and so shows up well against autumn leaves. Did you know… reflective materials work at night by bouncing back the light from a source. Many People Don’t Realise it but…reflective material on your clothing will not reliably help you to be seen in daytime (unless it is also fluorescent)! Although reflective tape can sometimes glint in the sunlight, it doesn’t show up properly to drivers until it after dark. So, for example, putting a reflector on a young child’s school bag will not help them to be seen as most journeys to and from primary school are in daylight or near dusk… unless it is also fluorescent which shows up in daytime/dusk. Micro-prismatic tape is made of special plastic vinyl. Lots of tiny prism shapes are sealed inside. These prisms bounce the light around and then straight back to the source. Glass bead tape is low cost and easy to add to a garment which is one reason why it is so popular. You can see it on our traditional high vis waistcoats. Do you know how to be bright? Test yourself here when you have read our section above. Answers below (no peeking!). 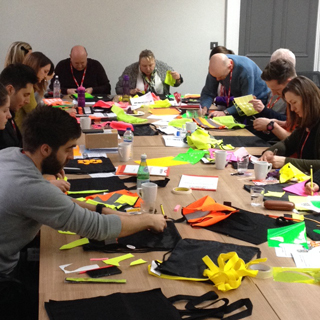 School travel professionals taking part in a Brightkidz Bright Bag Workshop to get ideas for schools they work with.